On to Lake Huron! Though we love Lake Erie, we are excited to experience Lake Huron. We’ve heard so much about the beautiful lake, clear water, amazing sunsets, great people, and the quaint small towns dotting the coast. And so the discovery begins! From Leamington we headed north to catch Hwy 21 which hugs the eastern Lake Huron coast. We planned to spend 4 nights and 3 full days exploring the 115 km/75 mile area from Bayfield to Southampton known for its sunsets and beautiful small towns. In planning the trip, we had a decision to make… should we stay in the south part of the area for 2 nights and in the north part of the area for 2 nights, or stay centrally for 4 nights and drive. We ultimately decided to stay centrally for a couple reasons… 1) it’s easier for us to drive than to move the trailer a lot and 2) there aren’t a lot of transient campground options in the area that appeal to us. We stayed at MacKenzie Tent and Trailer Park and were very pleased with our choice. It’s so tucked away that we were a little worried that the GPS was off when we were trying to find it! The minute we entered MacKenzie we knew we’d love it… wooded and spacious sites, a great playground, and direct lake access. MacKenzie has a very relaxed and family atmosphere. Though MacKenzie doesn’t have all of the campground amenities that some others do (no laundry facilities, very limited camp store, and the washrooms are basic but fine), it really didn’t matter because it is fantastic in so many other ways! Our first evening we explored the beach at the campground and planned the next few days. After looking at the southern part of the area we decided to skip going all the way back to Bayfield and instead planned to spend more time in Goderich. 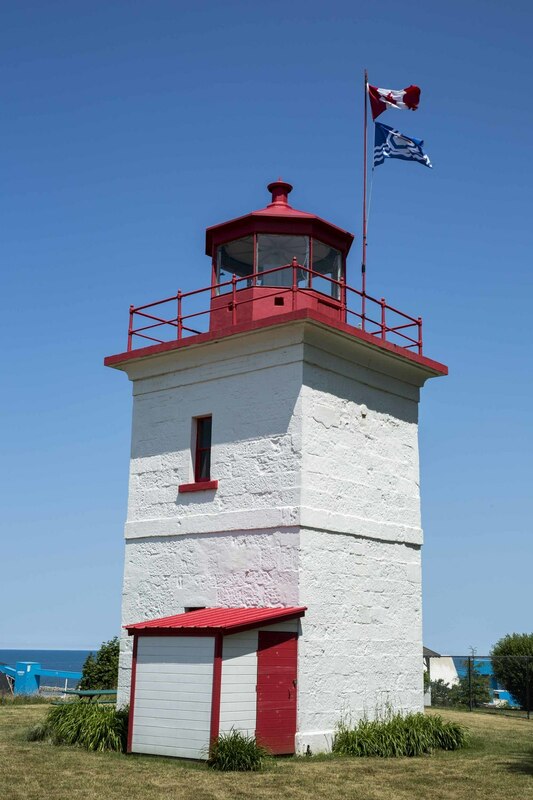 During our stay we visited Goderich, Point Clark, Kincardine, Port Elgin, and Southampton. Below are some general observations about the area followed by specific comments about each town. The area is very easy to get around… just go north up Hwy 21 and follow the signs to each town. If you need food, toiletry items, gas, ice, etc. there are lots of options on Hwy 21. The area is very tourist friendly and there are numerous guides to different towns and areas, information centers in some of the towns, and websites like sunsets.com and explorethebruce.com that offer information. The areas are well traveled, so you can find a lot of information on Tripadvisor as well. We noted a few hotels near the larger towns, bed and breakfasts in some of the towns, and it appeared that many towns have cottage rentals. Each town, without exception, has a beautiful public beach that is well maintained and well used. The water is super clear and, though there are rocks, there’s lots of soft sand. The beachfront areas all include great playgrounds… Daniel had a blast trying all of them out! There’s a welcoming, relaxed, family vibe to all of the beaches. Wow… the beach area is amazing! The Goderich beach is the most expansive of the communities we visited. There’s a long boardwalk that extends the length of the beach… if you don’t want to get sandy, just walk on the boardwalk! There are two very nice playground areas, a snack shack, and washrooms. The beach is right next to a very active harbor and we enjoyed watching freighters coming and going. Beach Street Station is the only restaurant in the beach area. It has a beautiful patio where we enjoyed an afternoon break. We were in Goderich on a Friday and planned to have dinner in town after spending the afternoon at the beach. After experiencing the vibe at the beach we expected the town, which is just east of the beach, to be buzzing with activity, but when we got there we were a bit surprised… not a lot of cars and hardly anyone walking around. The town is quite large with a beautiful town center and lots of businesses and restaurants. 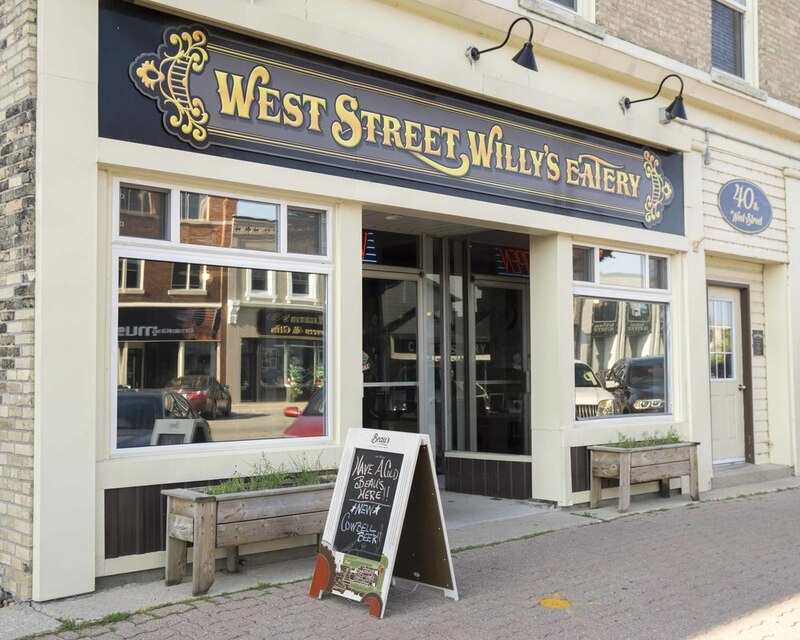 We picked West Street Willy’s Eatery for dinner because of its reviews and menu choices. The food was good, but the atmosphere was very rushed. After dinner we walked around a bit more… still not much activity… we stopped by Cravings ice cream shop, which has a great selection of ice cream, and headed back to the campground. 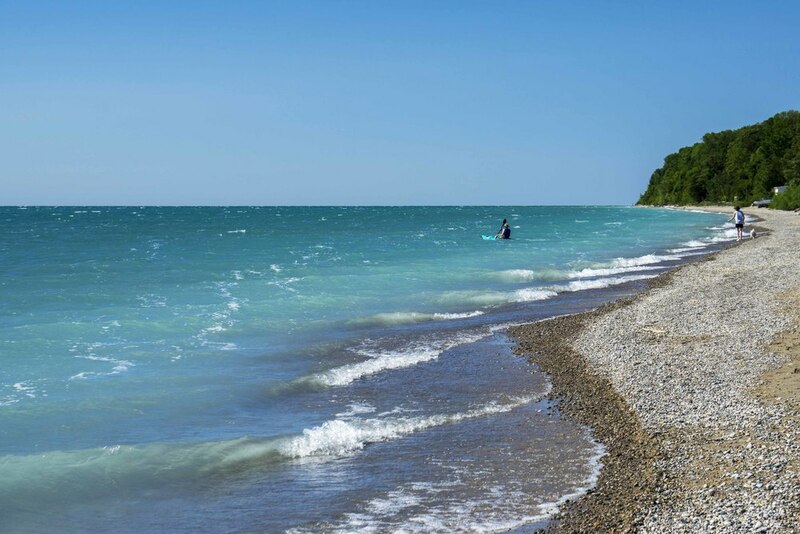 Maybe it was just the day we picked, but our sense is that Goderich is a great place for a few hours at the beach while passing through, but not a destination for a longer visit. 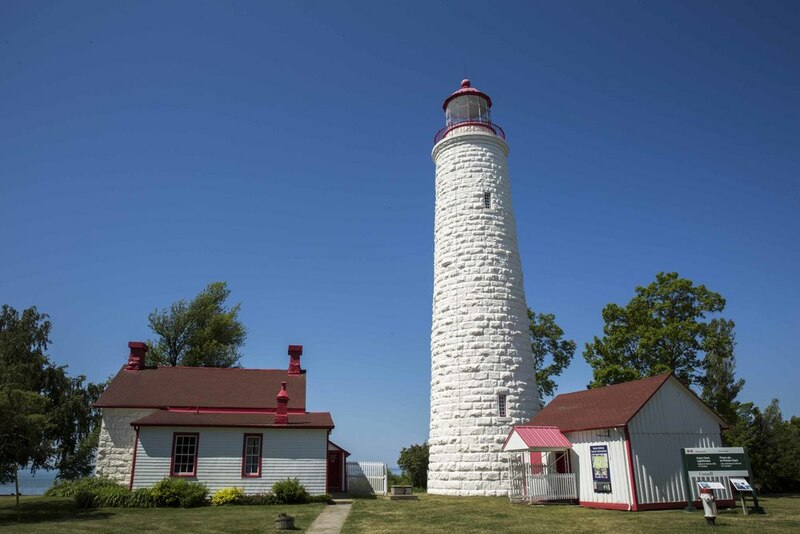 Point Clark is a little spot between Goderich and Kincardine that’s known for its historic and newly renovated lighthouse. We stopped by to check it out… the lighthouse is impressive and the setting is beautiful. The public beach shares the same parking lot and is very nice and includes a playground. The area is very residential, and we couldn’t find a “town”, so after visiting the lighthouse we moved on. Kincardine is one of the most advertised towns in the area… in addition to the beach and sunsets, it’s known for its Scottish heritage and vibrant community. We arrived on Saturday around 5:30 and went to the harbor where we found a marina, the beach (very beautiful), and the biggest playground yet. We walked up to town, which was hopping, for dinner at Bruce Steakhouse. Bruce Steakhouse doesn’t have the best reviews in town, but it’s patio is amazing and overlooks the harbor. We were very pleased with our food and the service. The menu includes a good assortment food… salads, bar food, tacos, fish and chips, and steak. Daniel was thrilled to get a soft pretzel and sliders. Todd and I both had salads that were great! We planned our visit to Kindardine on Saturday evening to experience the first bagpipe parade of the summer… each Saturday night during the summer at 8pm the Kincardine Scottish Pipe Band marches through the center of town. The crowd follows the band and is treated to some extra songs at the end of the parade. It is a ton of fun… everyone is super friendly and visitors are encouraged to participate along with the locals. After the parade we enjoyed the sunset and Daniel had fun on the playground. We had a great Saturday afternoon at the Port Elgin beach which was buzzing with activity! The beach area has a lot to offer… in addition to the beautiful beach, playground, and snack shack, there’s a put-put golf course. After a round of put-put golf we walked around the town. We noted a few restaurants with outdoor seating and some shops. There weren’t many people in town… they were all at the beach! When we arrived in Southampton we went to the beach for a walk. The beach is beautiful and full of activity. As we walked to town we noted a number of little restaurants, shops, and bed and breakfasts. It was time for lunch and after scouting out our options we chose Walker House… its back patio looked awesome and the menu had something for all of us. Our experience at Walker House was fantastic! The patio is shaded by a beautiful tree and the breeze from the lake felt perfect. Daniel ordered chicken fingers (if you are noticing a trend, Daniel loves chicken fingers!) and Todd and I had light salads. Todd had the Greek Salad and I had the California Greens salad… both were awesome! After lunch we stopped a couple places to pick up meat and produce. We found the Southampton Meat Market which has a butcher counter, deli meats and cheeses, and other novelty food items like crackers and jams. They also had a Cleveland Browns banner on the wall and cheered on the Cavs when we told them we are from Cleveland! Hi Berry Farm is just south of town and grows and sells all kinds of produce. We picked up fresh peas, strawberries, asparagus, kale, and spinach – all were fantastic! Simply said, we loved Southampton… maybe it was the time we were there or the day, but the vibe was great and we had an awesome time! Southampton is must-do on a Hwy 21 trip! We had a great time on the eastern Lake Huron coast, but could have cut our time short by a day. If we visit again, we’ll stay in the northern part of the area by Southampton and some other towns that we might not hit on this trip.